One in every 200 men alive today is a relative of Genghis Khan. An international team of geneticists has made the astonishing discovery that more than 16 million men in central Asia have the same male Y chromosome as the great Mongol leader. It is a striking finding: a huge chunk of modern humanity can trace its origins to Khan’s vigorous policy of claiming the most beautiful women captured during his merciless conquest. In the time of Genghis, he was known for his powers generated from shamanism. Mongolian shamanism is centered on the worship of the tngri (gods) and the highest Tenger (Heaven, God of Heaven, God) or Qormusta Tengri. In the Mongolian folk religion, Genghis Khan is considered one of the embodiments, if not the main embodiment, of the Tenger. The Mausoleum of Genghis Khan in Ordos City, in Inner Mongolia, is an important center of this worship tradition. What is it that makes people rise up against their neighbours and slaughter innocents in such a massive killing spree? In the case of the young Temüjin, when he was 9 his father was killed by a nomadic Mongol tribe known as the Tatars. He would have been the next Khan. Another tribe, the Taichi’uts, exiled his mother and her family to prevent Temüjin’s succeeding in being the next Khan. His mother lived through great hardship trying to bring her young family up. As a young adult, the Taichi’uts took Temüjin prisoner and intended to keep him in lifelong captivity. But Temüjin escaped. He will forever be a hero to his Mongol people, as he united his once disparate nomadic tribes and took the disjointed and languorous trading towns along the Silk Route, organising them into history’s largest free-trade zone. But first he and his armies killed more people in 25 years than the Romans had killed in 4 centuries. His soldiers wore more sophisticated armour than their enemies wore. 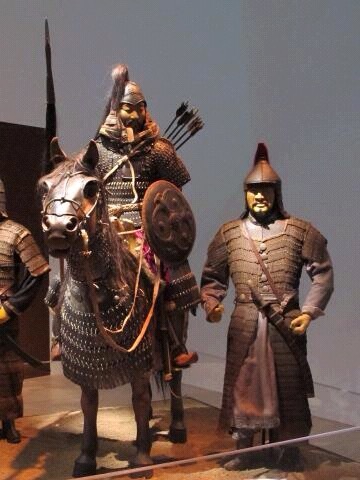 The magnificent Mongolian horses wore sophisticated armour too. The saddle on their horses enabled amazing movements of the rider whilst aiming their bows. Their sabres were designed well for slashing and cutting. Their trebuchet designs enabled successful devastation when they laid seige to walled cities. Their triple crossbow designs fired three arrows vs the single arrow of their enemy. They had superior strategies. They were inspired by the powerful shaman, Genghis Khan. According to the works of Iranian historian Rashid-ad-Din Fadl Allah, Mongols massacred over 700,000 people in Merv and more than a million in Nishapur. China suffered a drastic decline in population as a direct result of the Khan: before the Mongol invasion, China had about 100 million inhabitants; after the complete conquest, 1279, the census in 1300 showed it to have roughly 60 million people. As the Mongol Hordes took over the Buddhist believing populations, their shamanism merged with Buddhism. The invasions of Baghdad,Samarkand, Urgench, Kiev, Vladimir among others caused mass murders, such as when portions of southern Khuzestan were completely destroyed. Genghis’ grandson, Hulagu Khan destroyed much of Iran’s northern part. Hulagu’s army greatly expanded the southwestern portion of the Mongol Empire, founding the Ilkhanate of Persia, a precursor to the eventual Safavid dynasty, and then the modern state of Iran. Under Hulagu’s leadership, the siege of Baghdad (1258) destroyed the greatest center of Islamic power and also weakened Damascus, causing a shift of Islamic influence to the Mamluk Sultanate in Cairo. Genghis was furious about the destruction of Baghdad, but it is said that 800,000 of the inhabitants werekilled, including the caliph – who was executed by being kicked to death. The Mongol violence and depredations killed up to three-fourths of the population of the Iranian Plateau, possibly 10 to 15 million people. In much of Russia, Middle East, Korea, China, Ukraine, Poland and Hungary, Genghis Khan and his regime are credited with considerable damage, destruction and loss of population. The legend about his conquering Nishapur, took a terrible turn when the husband of Genghis Khan’s daughter was killed at Nishapur in 1221, she or Genghis ordered the death of the entire population of the city, which was reputedly 1.7 million. Their skulls were said to have been piled in pyramids by the Mongols. Nishapur is a city in the Khorasan Province, capital of the Nishapur County and former capital of Province Khorasan, in northeastern Iran, situated in a fertile plain at the foot of the Binalud Mountains. Their turquoise mines have supplied the world with turquoise for at least two millennia. The city was founded in the 3rd century by Shapur I as a Sasanian satrapy capital. Nishapur later became the capital of Tahirid dynasty and was reformed by Abdullah Tahir in 830, and was later selected as the capital of Seljuq dynasty by Tughril in 1037. From the Abbasid era to the Mongol invasion of Khwarezmia and Eastern Iran, the city evolved into a significant cultural, commercial, and intellectual center within the Islamic world. Nishapur, along with Merv, Herat and Balkh were one of the four great cities of Greater Khorasan and one of the greatest cities in the middle ages, a seat of governmental power in eastern of caliphate, a dwelling place for diverse ethnic and religious groups, a trading stop on commercial routes from Transoxiana and China, Iraq and Egypt. The first tribe Genghis attacked were the Tatars who had killed his father. 1219 — war with the empire of Khwarizm, ruled by Sultan Muhammad (covering the present-day countries of Turkmenistan, Uzbekistan, Tajikistan, Afghanistan, and most of Iran). Reaches Otrar. His forces lay siege and capture the town. 1220 — attacks and seizes Bukhara. Capture Samarqand. Finds and kills Sultan Muhammad. Crosses Caucasus mountains and defeats an army of Russians and Kipchak Turks in the Crimea. 1221 — crosses the Oxus into northern Afghanistan. His youngest son sacks towns in Persia. Sultan Jalal al-Din, the son of Sultan Muhammad, wins a battle at Parvan, north of Kabul, Afghanistan, but is then defeated on the banks of the Indus River. Genghis Khan starts back home. Ghengis died in his sleep, 1227, aged 65. His descendants expand the Mongol Empire. 1231 — Mongols conquer Korea. By 1235-Subodei had conquered as far as Georgia in 1221 and fought Russians in 1224- led an army of 50,000 Mongols and 100,000 allies north up the Volga River to Bulgaria. Mongke led a force south to take on the Kipchak Turks. Cities that did not agree to hand over ten percent of their wealth as tribute were attacked, and aristocratic rulers were put to death. Captives were enslaved and forced to fight at the front of the Mongol army and were killed if they did not. Kiev was taken in December 1240, looted, and then burned down. Mongol armies swept across Poland to Germany and through Hungary up to Vienna. A major battle was fought at Liegnitz on April 9, 1241 as the clever Mongols by retreating lured the German knights into swamps, where 25,000 were killed or captured. Prisoners were sold or put to work; miners helped develop the mineral resources in Dzungaria of western Mongolia. Hungarian king Bela IV retreated from the army of Subodei. The Mongols used burning oil and gun powder to cause panic, forcing the Hungarians to flee toward Pest. There Christian priests marched with bone relics, which offended the Mongols’ religion; two archbishops, a bishop, and many Templar knights were killed. In this war the Europeans lost nearly a hundred thousand knights. December 1241-Ogodei died of excessive drinking-and the next year the Mongols withdrew from Europe to Russia. They sold their prisoners to Venetian and Genoese merchants, who distributed them in Mediterranean markets; most ended up in Egypt’s slave army. By 1274 the Mongols had assembled ships built in Korea to invade Japan; but after winning a battle on land, a storm destroyed the fleet, and 13,000 invaders were lost. When a large rebellion erupted in Jiangnan- China in 1279, the Mongol army crushed it in 1281 and beheaded 20,000 rebels. Tibet-1285-The Brigung sect attacked his Saskya sect and the Mongols in 1285. Khubilai sent his son Temur Bukha with an army that destroyed the Brigung monastery and killed 10,000 men in 1290 in Tibet. In 1281 a Korean fleet invaded Japan again and was to be joined by a Chinese fleet, which arrived late; but again a storm destroyed them, drowning about a hundred thousand. Southern Chinese merchants complained about building 500 more boats for a third invasion, and Khubilai cancelled the campaign in 1286. In 1287 the Mongols occupied Hanoi -Vietnam. Khubilai sent an army to invade Burma in 1283, and in 1287 they occupied Pagan for a few months. In 1289 Java’s Kertanagara branded the Mongol envoy on his face. A naval expedition with a thousand boats led by Gao Xing went to Java in 1293, but despite the current civil war in Java they fell into an ambush and retreated. Italian traveler Marco Polo served Khubilai Khan from 1275 to 1291- he wrote that anyone encountered by the funeral procession of a Khan was killed, claiming that 20,000 were put to death when Mongke Khan died in 1259;Khubilai celebrated the religious feasts of all major religions, revering Jesus, Muhammad, Moses, and Sakyamuni (Buddha). He thought the Christian faith was best, because he found its teachings only good and holy. However, with so few Christians in his empire Khubilai would not accept baptism unless the Pope sent him a hundred religious scholars to teach the religion; but his repeated requests for this were ignored. Marco Polo also described the incredible wealth and luxuries of Khubilai’s court and the speed of his postal messengers, who covered over 200 miles per day on horseback. Marco Polo praised the comfort of stations on the trade routes every twenty or thirty miles. Where possible Khubilai had trees planted along these roads, because his advisors told him those who plant trees live long. In addition to providing food and clothing for the poor, he also supported about 5,000 astrologers and soothsayers. Although the Mongols obviously dominated by using violent warfare, they contributed to world culture by promoting free trade, allowing open communication, sharing knowledge and technology, tolerating religious diversity under a secular state, and encouraging diplomatic immunity. Khubilai died in 1294 and was succeeded by his grandson Temur. Zhongdu, the “Central Capital” of the Jurchen Jin dynasty, was located at a nearby site now part of Xicheng District. It was destroyed by Genghis Khan in 1215 when the Jin court began contemplating a move south to a more defensible capital such as Kaifeng. The Imperial Mint (诸路交钞提举司) established in 1260 and responsible for the printing of chao, the Yuan fiat paper money, was probably located at nearby Yanjing even before the establishment of the new capital. The construction of the walls of the city began in the same year, while the main imperial palace (大内) was built from 1274 onwards. The design of Khanbaliq followed several rules laid down in the Confucian classic The Rites of Zhou, including “9 vertical and horizontal axes”, “palaces in front, markets in back”, “ancestral worship to the left, divine worship to the right”. [clarification needed] It was broad in scale, strict in planning and execution, and complete in equipment. As part of the Great Khans’ policy of religious tolerance, Khanbaliq had various houses of worship. It even was the seat of a Roman Catholic Archdiocese of Khanbaliq from 1307 until its 1357 suppression; it was restored in 1609 as (then) Diocese of Peking. This entry was posted in Uncategorized and tagged China, christianity, conquest, destruction, faith, Ghengis Khan, Middle Ages, Mongolia, religion, Silk Road, tolerance, trade. Bookmark the permalink. I had always known the Mongols as being great conquerors, but that timeline really showed me how vast a reach they had! Amazing.